I went to Odyssy this Saturday to buy I don’t wear sunscreen and One minute to death. But both these books were not on sale there. 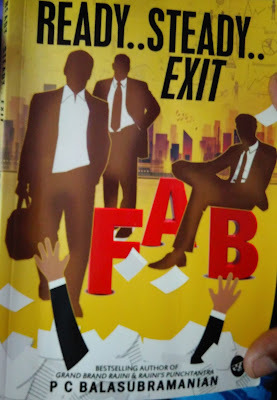 Then I remembered ‘Ready Steady Exit’ by another Chennai based author, PC Balasubramanian. Book is priced at only Rs 120, so bought it without any hesitation. Finished reading it within a day and this post is a brief review of the book. Plot is simple and straight forward-about two commerce graduates setting up an accounting services firm and eventually selling it off. If I write too much I might risk revealing the plot, so let me tell you in simple points why I liked this book or why you should consider reading it. Reading the book will give you confidence that even fresh graduates from middle class family without lots of money or business oriented family background can succeed in building simple company and growing it many fold. If you have some good service to offer, there will always be some customers. If you can sustain, growth will come naturally. Be very careful about giving away equity stake-it may seem harmless and cashless way in the beginning but can come back to haunt you big time when your company is worth crores. It is very good that author has stayed focused on the core topic of the plot (the two CA professionals and their company). There is no unnecessary masala, extra marital relationships etc. Usually authors tend to induce such things in the plot to cater to specific segment of readers who look for such stuff or to fill pages. PC Balasubramanian has stayed clear of such tactics, though plot had provisions for such sub stories. I liked this approach. It also helps contain the book to 172 pages. It was mentioned that Gautam would return to Chennai by Chennai mail, but left home in Malleswaram by 7PM. Chennai mail leaves at 10.40PM, so the gap seemed too much to me. Otherwise couldn’t find any factual errors. On one or two pages proof reading needs a revisit. Otherwise overall the book is informative. It is positioned under fiction, but has lots of real life lessons. Grab a copy. Nice review. No extra masala? Good then we will read this book. Thanks a lot for reading it and posting a review. I really liked your review and agree that I could have perhaps added a lot more emphasis on downside / challenges. My focus to tell a story that has life lessons in a subtle way with plenty of humour and satire may have forced me indirectly to lessen the villainy portions. Your review does help me and thanks once again. I am really glad that you liked the book and you are recommending people to read it, thanks. Can I borrow your copy?